This full-day course not only covers diet and nutrition but also hydration. Hydration is particularly important in the care and hospital sectors. The course aims to promote awareness of the importance of diet, nutrition and hydration and knowledge of how to provide a balanced and nutritional diet. By the end of the course, candidates will be able to identify the changing needs of people, be aware of the legislative requirements and obligations, understand our body's nutritional needs, understand what is needed to achieve a balanced diet, have a basic awareness of how to store and prepare food, how to identify and respond to individual needs, and be aware of the importance of food presentation. 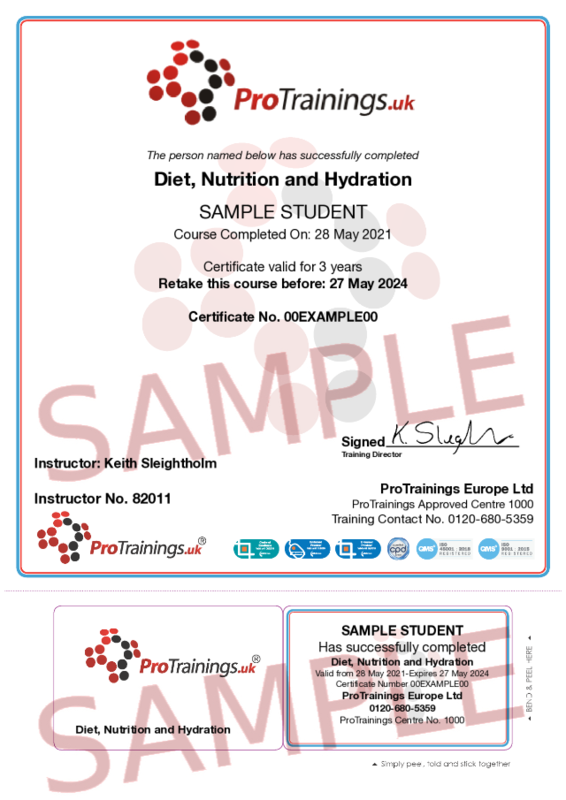 Diet, Nutrition and hydration is a trainer-led course that is delivered with a guided learning hours of 6 hours and available nationally through our approved instructors.